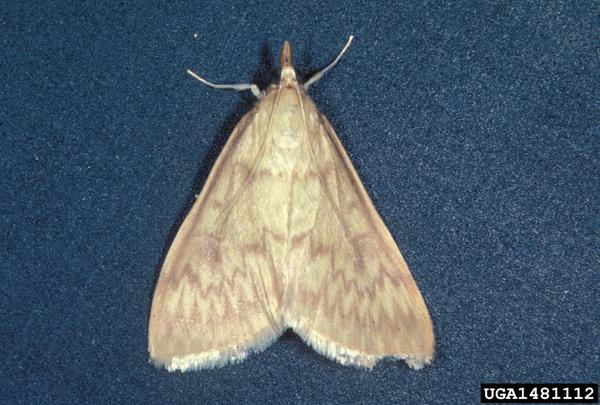 European corn borer is an infrequent pest of strawberries in the southeastern United States. The larvae are highly polyphagous, feeding on a range of wild and cultivated plants. Crop hosts include corn, peppers, potatoes, snap beans, and rarely, strawberries. European corn borers typically have 3 to 4 generations in the southeastern United States. Adult European corn borer moth. European corn borer damage in strawberry is rare and typically only occurs during particularly warm growing seasons. Moths may lay eggs on or near the stem end of ripening or ripe berries. Larvae then bore into fruit and may not be easily observed until fruit are harvested and the caylx is removed. Because European corn borer is such and infrequent pest in strawberries, there are no thresholds developed. Pheromone traps are frequently used to monitor this pest in other crops, but it is unlikely that trapping would yield useful information for management in strawberries. European corn borer larvae may be detected when fruit are sampled for spotted wing drosophila, and care should be taken to distinguish between these larvae. 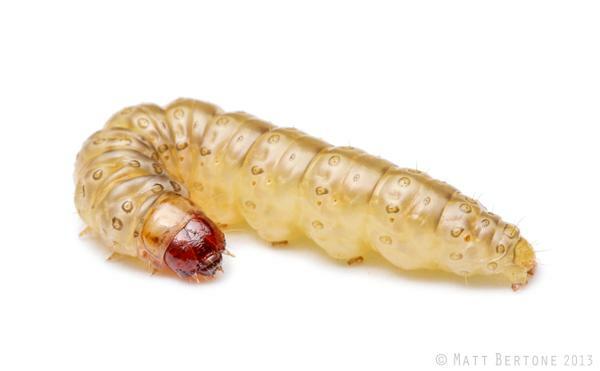 European corn borer larvae have distinct heads, three forelegs, and many rear "prolegs." Sap beetle larvae also have distinct heads and three forelegs, but sap beetles have bristles which are absent on European corn borer larvae. If European corn borer damage is often detected after larvae have tunneled into fruit, pesticides will be ineffective, and removal of damaged fruit is the most effective option. While some insecticides are effective against European corn borer, these must be carefully timed to egg hatch.